For other uses, see Interchange (disambiguation). "Offramp" redirects here. For other uses, see Offramp (disambiguation). In the field of road transport, an interchange is a road junction that uses grade separation, and typically one or more ramps, to permit traffic on at least one highway to pass through the junction without interruption from other crossing traffic streams. It differs from a standard intersection, where roads cross at grade. 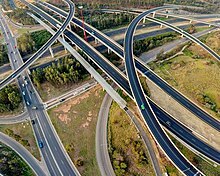 Interchanges are almost always used when at least one road is a controlled-access highway (freeway or motorway) or a limited-access divided highway (expressway), though they are sometimes used at junctions between surface streets. Note: The descriptions of interchanges apply to countries where vehicles drive on the right side of the road. For left-side driving, layout of the junctions is the same, only left/right is reversed. A freeway junction or highway interchange (US) or motorway junction (UK) is a type of road junction linking one controlled-access highway (freeway or motorway) to another, to other roads, or to a rest area or motorway service area. In the UK, most (but not all) junctions are numbered sequentially. In the US, interchanges are either numbered by to mileage (in most states) or by interchange number. A highway ramp (referred to in North America as exit ramps / off-ramps or entrance ramps / on-ramps) or slip road is a short section of road that allows vehicles to enter or exit a controlled-access highway (freeway or motorway). A directional ramp tends toward the desired direction of travel: A ramp that makes a left turn exits from the left side of the roadway (a left exit). Left directional ramps are relatively uncommon, as the left lane is usually reserved for high-speed through traffic. Ramps for a right turn are almost always right directional ramps. A non-directional ramp goes opposite to the desired direction of travel. Many loop ramps (as in a cloverleaf) are non-directional. A semi-directional ramp exits in a direction opposite from the desired direction of travel, then turns toward the desired direction. Many flyover ramps (as in a stack) are semi-directional. A U-turn ramp leaves the road in one direction, turns over or under it, and rejoins in the opposite direction. Weaving is an undesirable situation where traffic veering right and left must cross paths within a limited distance, to merge with traffic on the through lane. The German Autobahn system has Autobahn-to-Autobahn interchanges of two types: a four-way interchange, the Autobahnkreuz (AK), where two motorways cross; and a three-way interchange, the Autobahndreieck (AD), where two motorways merge. Some on-ramps have a ramp meter, a dedicated mid-ramp traffic light that controls the flow of entering vehicles. A complete interchange has enough ramps to provide access from any direction of any road in the junction to any direction of any other road in the junction. A complete interchange between a freeway and another road (not a freeway) requires at least four ramps. Complete interchanges between two freeways generally have at least eight ramps, as having fewer would considerably reduce capacity and increase weaving. Using U-turns, the number for two freeways can be reduced to six, by making cars that want to turn left either pass by the other road first, then make a U-turn and turn right, or turn right first and then make a U-turn. Depending on the interchange type and the connectivity offered other numbers of ramps may be used. For example, if a highway interchanges with a highway containing a collector/express system, additional ramps can be used to strictly link the interchanging highway with the collector and express lanes respectively. For highways with high-occupancy vehicle (HOV) lanes, ramps can be used to service these carriageways directly, thereby increasing the number of ramps used. An incomplete interchange has at least one or more missing ramps that prevent access to at least one direction of another road in the junction from any other road in the junction. Typical cloverleaf interchange; shown is the former configuration of Interstate 270 and State Route 161 at the border of Columbus and Blendon Township, Ohio, United States. This interchange was modified to a cloverstack in the early 2000s. A cloverleaf interchange is typically a two-level, four-way interchange where all turns across opposing traffic are handled by non-directional loop ramps. Assuming right-handed traffic, to go left vehicles first cross over or under the target route, then bear right onto a sharply curved ramp that turns roughly 270 degrees, merging onto the target route from the right, and crossing the route just departed. These loop ramps produce the namesake cloverleaf shape. Two major advantages of cloverleaves are that they require only one bridge (between the main perpendicular routes) which makes such junctions inexpensive as long as land is plentiful, and that they often do not require any traffic signals to operate. However, weaving is a major shortcoming of cloverleaves, as the four total offramps and onramps are present (the onramp from one leaf overlaps with the offramp for the next leaf), and merge on the main routes. Consequently, the capacity of this design is comparatively low. Cloverleaves also use a considerable area of land, and are more often found along older highways, in rural areas and within cities with low population densities. A variant design separates all turning traffic into a parallel carriageway to minimize the problem of weaving. Collector and distributor roads are similar, but are usually separated from the main carriageway by a divider, such as a guard rail or Jersey barrier. A stack interchange is a four-way interchange whereby a semi-directional left turn and a directional right turn are both available. Usually access to both turns is provided simultaneously by a single offramp. Assuming right-handed driving, in order to cross over incoming traffic and go left, vehicles first exit onto an off-ramp from the rightmost lane. After demerging from right-turning traffic, they complete their left turn by crossing both highways on a flyover ramp or underpass. The penultimate step is a merge with the right-turn on-ramp traffic from the opposite quadrant of the interchange. Finally an onramp merges both streams of incoming traffic into the left-bound highway. As there is only one offramp and one onramp (in that respective order), stacks do not suffer from the problem of weaving, and due to the semi-directional flyover ramps and directional ramps, they are generally safe and efficient at handling high traffic volumes in all directions. A standard stack interchange includes roads on four levels, also known as a four-level stack: including the two perpendicular highways, and one more additional level for each pair of left-turn ramps. These ramps can be stacked in various configurations above, below, or between the two interchanging highways. This makes them distinct from Turbine interchanges, where pairs of left-turn ramps are separated but at the same level. There are some stacks that could be considered five-level; however, these remain four-way interchanges, since the fifth level actually consists of dedicated ramps for HOV/bus lanes or frontage roads running through the interchange. Stacks are significantly more expensive than other four-way interchanges, due to the design of the four levels. Additionally they may suffer from objections of local residents, because of their height and high visual impact. Large stacks with multiple levels may have a complex appearance and are often colloquially described as Mixing Bowls, Mixmasters (for a Sunbeam Products brand of electric kitchen mixers), or as Spaghetti Bowls or Spaghetti Junctions (being compared to boiled spaghetti). However they consume significant less area of land compared to a cloverleaf interchange. Cloverstack interchanges are hybrid interchanges, using loop ramps like cloverleaves to serve slower or less occupied traffic flow and flyover ramps like stack interchanges to serve faster and higher occupied traffic flow. If local and express ways serving the same directions and each roadway is connected righthand to the interchange, extra ramps are installed. The cloverstack design is commonly used to upgrade cloverleaf interchanges to increase their capacity and eliminate weaving. Another alternative to the four-level stack interchange is the turbine interchange (also known as a whirlpool). The turbine/whirlpool interchange requires fewer levels (usually two or three) while retaining semi-directional ramps throughout, and has its left-turning ramps sweep around the center of the interchange in a spiral pattern in right-hand traffic. Turbine interchanges offer slightly less vehicle capacity because the ramps typically turn more often and change height more quickly. They also require more land to construct than the typical four-level stack interchange. In areas with rolling or mountainous terrain, turbine interchanges can take advantage of the natural topography of the land due to the constant change in the height of their ramps, and hence these are commonly used in these areas where conditions apply, reducing construction costs compared to turbine interchanges built on level ground. The Vaanplein junction in the Netherlands from 1977 was a windmill before it was renovated. A windmill interchange is similar to a turbine interchange, but it has much sharper turns, reducing its size and capacity. The interchange is named for its similar overhead appearance to the blades of a windmill. The Vaanplein junction in the Netherlands was a windmill from its opening in 1977. Since then it was renovated into a complex hybrid, combining stack, windmill and trumpet elements. A variation of the windmill, called the diverging windmill, increases capacity by altering the direction of traffic flow of the interchanging highways, making the connecting ramps much more direct. There is another type of four-way interchange which is also called a "windmill" interchange, but it is otherwise not related to the windmill interchange described above. The term "windmill" has been applied to this type mainly by "roadgeeks", but the term has also been used by academics. The "windmill" serves two arterial roadways by grade separation. All turning movements are served by a right-hand exit ramp, with stop signs or traffic signals at the ramp termini; thus it is not a free-flow interchange. This application is best suited for locations where free-flow through movements are desired for both intersecting roadways, with moderate to low turning movement volumes. This interchange design is best suited for rural locations where right-of-way is available at the intersection quadrants and quadrant development is low to minimize attraction of turning movement volumes. The only known example of this design exists at the junction of US 35 and State Route 32 near Jackson, Ohio, United States (at 39°02′43″N 82°36′46″W﻿ / ﻿39.045219°N 82.612767°W﻿ / 39.045219; -82.612767). Both highways are expressways in each direction. Each highway has ramps that exit to the other highway, with right-turning traffic merging onto the second highway, but left-turning traffic coming to an at-grade intersection. Both highways end up having at-grade intersections, albeit with a grade separation of the main highway corridors. A similar concept involves a partial cloverleaf interchange ("parclo") type A4, since that type of junction involves turning traffic off the freeway turning left onto the arterial, though the arterial itself exits with loop ramps eliminating left-hand turns onto the freeway, as well as to not invoke at-grade crossings for left turns onto the freeway. A further alternative found often is called a roundabout interchange. This is a normal roundabout except one (two-level) or both (three-level) mainlines pass under or over the whole interchange. The ramps of the interchanging highways meet at a roundabout or rotary on a separated level above, below, or in the middle of the two highways. Hybrid interchanges use a mixture of interchange types and are not uncommon. Their construction can consist of multiple interchange designs such as loop ramps, flyovers and roundabouts. Divided volleyball interchanges create a wide median between the carriageways of the two interchanging highways, using this space for connecting ramps. Full diamond interchanges are large, multi-level interchanges that use flyover/under ramps to handle both right and left turns. One example is the junction of Interstate 40 and I-44 in Oklahoma City. On interchanges with U-turns, traffic intending to complete a left turn must either pass the interchange, make a U-turn and then exit right, or exit right first and then make a U-turn. 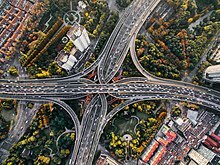 There is a rarely used, unnamed type of interchange using a grade-separated design, similar to the at-grade design known as a "synchronized split-phasing intersection". It is somewhat like the diverging windmill except that left turn exits use left directional ramps, which, as with the diverging windmill, merge on the left. One such interchange formerly existed between Interstate 95 and I-695 north of Baltimore, which has since been replaced by a four-level stack. There are few of these "synchronized split-phasing" interchanges, including one in Birmingham, Alabama between I-65 and I-20/I-59, locally called Malfunction Junction. A variation of this type exists in Grand Rapids, Michigan between Interstate 196 and US 131, where only the opposing carriageways of US 131 cross over each other, while the carriageways for I-196 do not cross over, but pass through the interchange on different levels. A trumpet interchange on the Sir John A. Macdonald Parkway in Ottawa, Ontario. Trumpet interchanges have been used where one highway terminates at another highway. These involve at least one loop ramp connecting traffic either entering or leaving the terminating expressway with the far lanes of the continuous highway. Trumpet interchanges are named as such due to their resemblance to trumpets. The bell of a trumpet can be seen where the terminating highway begins to interchange with the continuous highway, and the resemblance to the tubing is seen along the connecting loop ramps. Occasionally a third ramp can be routed around the loop instead of one of the non-looping ramps. A vehicle will therefore diverge from the continuous highway, cross it, turn 270 degrees left and cross the continuous highway again (or vice versa if the ramp is for traffic turning off the continuous highway). An example of this is where the Kingsway Tunnel terminates on the A59 in Liverpool, England - because of the steep gradient of the tunnel approach there was insufficient space for a simple left-turning ramp. These interchanges are very common on toll roads, as they concentrate all entering and exiting traffic into a single stretch of roadway, where toll plazas can be installed once to handle all traffic, especially on ticket-based tollways. A double-trumpet interchange version can be found where a toll road meets another toll road or a free highway. They are also useful when most traffic on the terminating highway is going the same direction. The turn that isn't used as often would get the slower loop ramp. Such designs are most often found in the United States, Japan and Italy. There is a rarely built four-leg interchange type based on the trumpet interchange, of which there are two examples each in the United States and Singapore, one each in Sweden and Norway. One of the earliest examples of this interchange type was constructed in the 1950s and existed until 2005 at the junction between Interstate 94 and US 24 in Taylor, Michigan. A full Y-interchange (also known as a directional T interchange) is typically used when a three-way interchange is required for two or three highways interchanging in semi-parallel/perpendicular directions, but it can also be used in right-angle case as well. Their connecting ramps can spur from either the right or left side of the highway, depending on the direction of travel and the angle. Directional T interchanges use flyover/underpass ramps for both connecting and mainline segments, and they require a moderate amount of land and moderate costs since only two levels or roadway are typically used. They get their name due to their resemblance to the capital letter "T", depending upon the angle from which the interchange is seen and the alignment of the roads that are interchanging. It features directional ramps (no loops, or weaving right to turn left) and can use multi-lane ramps in comparatively little space. Some designs have two ramps and the "inside" thru road (on the same side as the freeway that ends) crossing each other at a three-level bridge. The disadvantage is that traffic of the terminating road enters and leaves on the passing lane. The T interchange is preferred to a trumpet interchange because a trumpet requires a loop ramp by which speeds can be reduced, but flyover ramps can handle much faster speeds. It is sometimes known as the "New England Y", as this design is often seen in the northeastern United States, as with the Braintree Split and the northern terminus of MA Route 24, both south of Boston. Like a directional T interchange, a semi-directional T interchange uses flyover (overpass) or underpass ramps in all directions at a three-way interchange. However, in a semi-directional T some of the splits and merges are switched to avoid ramps to and from the passing lane, eliminating the major disadvantage of the directional T. Semi-directional T interchanges are generally safe and efficient, though being three-level interchanges they do require more land and are costlier than trumpet interchanges. Semi-directional T interchanges are built as two or three-level stacks. Three-level stacks may use an overpass and underpass at a single point. Two-level stacks have a longer bridge or two shorter bridges on the same roadway. Hybrid interchanges use a mixture of interchange types and are not uncommon. Their construction can consist of multiple interchange designs such as loop ramps and flyovers. A half-clover interchange is essentially half a cloverleaf interchange, constructed to connect in just three directions instead of four. These are rarely used due to the traffic weaving that they cause and the large amount of land that they consume, but they can be built in areas where the connecting ramp along the loop of a trumpet interchange is not feasible due to building developments or physical limitations. Half-clovers are designed to be readily upgraded to full cloverleaves if the terminating highway is ever extended past the through highway. Numerous half-clovers exist along I-90/I-94 in the Chicago, Illinois area. A 3/4 volleyball interchange is a divided-volleyball interchange designed to meet at three points instead of four. Like the half-clover, it can easily be upgraded to a fully divided volleyball interchange if the terminating highway is extended beyond the through highway. A T-bone interchange is essentially a compacted directional T interchange with sharper turns and a lower capacity, built when there is insufficient land or funds to build a directional T. Its two flyover/flyunder ramps contract together after passing over the through highway, but then they split into two segments, resembling the bone in a T-bone steak. A half-trumpet interchange is essentially a trumpet interchange with either its loop ramp or the outer connecting ramp (but not both), and only one of its directional ramps, instead of two, designed to meet the continuous highway in one direction, usually on a 90-degree or semi-perpendicular angle. Should the need arise it can easily be upgraded into a full trumpet interchange, making it a three-way interchange. Two examples exist in Michigan: Between Main Street and M-14 in Ann Arbor, and between Edward N. Hines Drive and Ford Road (M-153). Hybrids, variations, and rare types also exist for two-way interchanges. A basketweave interchange is commonly found on highways using a collector/express system or long collector/distributor lanes. In a basketweave one highway is able to interchange with itself, allowing traffic traveling in the same direction to switch between carriageways through the use of flyover/under ramps created between two carriageways without causing weaving. These interchanges usually involve left exits and entry for the outer carriageway (right in left-hand drive) but can be configured to meet on the right. A diamond interchange is an interchange involving four ramps where they enter and leave the freeway at a small angle and meet the non-freeway at almost right angles. These ramps at the non-freeway can be controlled through stop signs, traffic signals, or turn ramps. Diamond interchanges are much more economical in use of materials and land than other interchange designs, as the junction does not normally require more than one bridge to be constructed. However, their capacity is lower than other interchanges and when traffic volumes are high they can easily become congested. A dumbbell interchange is similar to the diamond interchange, but uses a pair of roundabouts to join the ramps with the non-highway. This typically increases the efficiency of the interchange when compared to a diamond. A dogbone interchange is similar to the dumbbell interchange except the roundabouts do not form a complete circle, instead having a "raindrop" or "teardrop" shape. This does not impede normal traffic movement, as the eliminated portions are only useful for U-turns on the cross street. A parclo interchange, also known as a partial cloverleaf, is an interchange usually involving four to six ramps, two of which are loop ramps, which connect to the non-highway. The parclo is a safer modification of the cloverleaf design. Depending on the number of ramps used, they take up a moderate to large amount of land and are typically inexpensive to build. Parclos with more ramps have a greater capacity and efficiency than parclos with fewer ramps. Parclos are sometimes called a folded diamonds when only four ramps, in two quadrants, are used. If the loop ramps are constructed opposite or mirrored along the highway, weaving is avoided. Cloverleaf interchanges that involve a non-highway can be changed to parclos without too much reconstruction. Although the interchange's capacity is reduced, weaving is eliminated, increasing the safety and efficiency of the interchange. A diverging diamond interchange (DDI) or double crossover diamond interchange (DCD) is similar to a traditional diamond interchange, except the non-highway lanes cross each other twice, once on each side of the highway. This allows all highway entrances and exits to avoid crossing the opposite direction of travel and saves one signal phase of traffic lights each. The first DDIs were built in France in the 1970s. Despite the fact that such interchanges already existed, the idea for the DDI was "reinvented" around 2000, inspired by the former "synchronized split-phasing" type freeway-to-freeway interchange between Interstate 95 and I-695 north of Baltimore. The first diverging diamond interchange in the United States opened on July 7, 2009, in Springfield, Missouri, at the junction of Interstate 44 and Missouri Route 13. Single point urban interchange in Florida, United States, 28°33′14″N 81°16′12″W﻿ / ﻿28.5538°N 81.2699°W﻿ / 28.5538; -81.2699, dismantled in the early 2010s. A single-point urban interchange, often abbreviated to SPUI, is a modification of the diamond interchange and has its ramps meet at one point, usually on the overpass/underpass of the non-highway. This requires only one set of traffic signals, increasing its efficiency and capacity when compared to a diamond. Freeways in the Phoenix, Arizona metropolitan area are great examples of the utilization of SPUI interchanges. Some examples of SPUI are along Arizona State Route 51 from Downtown Phoenix all the way to Loop 101, another location where SPUI is common. Some single-point urban interchanges have appeared in rural areas, such as U.S. Route 23 with State Highway 59 in the U.S. state of Michigan. Therefore, while "single-point urban interchange" is the most common name for this type, it is sometimes (and more accurately) called a single-point diamond interchange instead. Highway/non-highway hybrid interchanges consist of diamond and partial cloverleaf elements. Their construction can consist of multiple interchange designs such as loop ramps, flyovers, and roundabouts. One form of the roundabout interchange can be used to connect a highway with a non-highway. It uses a single roundabout, rotary, or traffic circle which spans the highway as an over/underpass. Such junctions can be improved by adding a flyover for straight-through traffic on the non-freeway, creating the Roundabout interchange. The three-level diamond interchange is three levels high, and it handles interchanging ramps via four intersections. This kind of an interchange can also be used to connect two highways together, but due to the use of intersections, its traffic is not free-flowing. ^ "Fact Sheet - Light Horse Interchange" (PDF). Westlink Motorway Limited. May 2006. ^ "Motorways (253 to 273) – Joining the motorway (259)". The Highway Code. Government of the United Kingdom. June 27, 2014. Retrieved November 8, 2014. ^ "Motorways (253 to 273) – Leaving the motorway (272 to 273)". The Highway Code. Government of the United Kingdom. June 27, 2014. Retrieved November 8, 2014. ^ a b c Iowa Department of Transportation (1995-09-01). "Cross Sections of One-Way Ramps and Loops" (PDF). Retrieved October 19, 2009. ^ ATTAP (March 9, 2017). "Unconventional Intersection/Interchange Designs & Strategies". Windmill Interchange. University of Maryland. Retrieved August 27, 2017. ^ a b Chlewicki, Gilbert (2003). "New Interchange and Intersection Designs: The Synchronized Split-Phasing Intersection and the Diverging Diamond Interchange" (PDF). Archived from the original (PDF) on October 20, 2011. Retrieved October 20, 2009. ^ a b "Interchanges: Trumpet". kurumi.com. Retrieved June 17, 2017. ^ "Missouri Department of Transportation" (PDF). ^ Staff (June 2011). "I-44/Route 13 Interchange Reconstruction: Diverging Diamond Design". Missouri Department of Transportation. Archived from the original on June 7, 2011. Retrieved October 3, 2015. 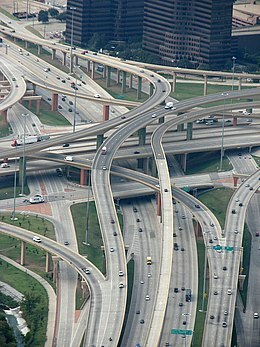 Wikimedia Commons has media related to Interchanges.